We value your business and we’d love to hear what you have to say! 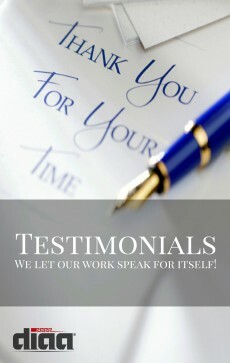 How was your experience shopping with us?.. Tell us more about the exceptional selection and service your received…Sharing your experiences will help us serve you better and help others who are looking for information about the products and service we provide. Please take a moment and post a review at the following sites. Thank you in advance for your time and for your continued support! Ellie was so amazing! It was crazy that we found this little shop (what a gem) but we stopped in cause they had such great reviews online. She spent so much time with me and my sister. As soon as I showed her the type of dress I was looking for (in a picture from online), she went in the back and pulled out the perfect dress for me. She went above and beyond to make sure that we where comfortable with our sudden decision to buy my wedding gown on the spot. I wasn't sure if I was going to have that moment of excitement when you find the dress and you just know it's the right one, but I had it and it's real! She even offered to talk to my mom on the phone to make her feel better about us buying the dress without her seeing it first. It was like the dress was made for me and it had a veil that matched it perfectly. The price was the most reasonable that I found of any shop that I had been to. Ellie and her husband, Diaa, have decided that they'd like to relocate to warmer climates so they are having a moving sale with mark downs on their merchandise. So even with reasonable prices, there were additional sales, which is why I felt I couldn't wait to buy this dress. Go see Ellie before while she's got a huge selection. Those prices are too good to pass up for the quality of the gowns! She's a wonderful lady that truly cares about her customers! Having 3 girls, we've been to several dress shops over the past several years. None have come close to the selection and service that we received at Diaa Designs. His dresses are custom designed but there's also a selection of other designers to choose from. His wife Ellie is absolutely amazing and had a great eye for what was flattering to each of my girls. She was extremely helpful in assisting with their choice of dresses and was just as personable while doing it. We love "dress shopping time" so that we can go and visit Ellie! Also, they are very reasonable in allowing payment arrangements, as with having 3 girls we definitely needed that flexibility! Diaa Designs is absolutely amazing. I love Ellie and the dresses are always beautiful. I couldn't imagine a better place to be for homecoming or prom. Such a fantastic shop with such amazing people. Diaa and Ellie went above and beyond to help us with dress selection. They are truly wonderful people that are extremely talented in what they do. I recommend them to anyone searching for a formal gown!!! Ellie from Diaa's gave me such personalized service, was friendly and accommodating I was so pleased that I was able to find my wedding dress, as well as the shoes and jewelry all in one shop. They have such a variety of styles and prices I was very impressed with this shop. If you are looking for a Wedding Dress this is the place to go. I was so impressed by the service we received and the selection they have my daughter found the perfect dress and is very happy. I love this bridal shop and the owner! She was so nice to me and my daughter!! I'm so glad I know where to go from now on when I need any type of dress and the prices are right! Thank you again for being so nice and so helpful. Outstanding! Ellie and Diaa have dressed me from freshman to senior year and on. Their dresses are one of a kind and beautiful. I have no regrets! Thank you for making all those memorable events in my life even more wonderful by your dresses and also thank you for being wonderful in every way.